From studying bats and sharp-tailed grouse habitat to attending fire ecology workshops and meeting with tribal leaders, students involved in the first Native American Assistantship offered by The Wildlife Society and the U.S. Forest Service learned more than they could have imagined about wildlife and ecology through Native American culture. The 14-week assistantship, which launched this past spring, provides Native American students aspiring to become wildlife biologists with the opportunity to work with wildlife professionals on individual projects, get hands-on experience, and meet with Native American tribal leaders. Three students —Raymond Gutteriez, Jessica Lackey and Alayna Johnson — took advantage of this year’s assistantship, working with USFS Research and Development scientists Jonathan Long and Deahn Donner on wildlife ecology projects. For instance, Gutteriez, a graduate student at SUNY-College of Environmental Science and Forestry, and Lackey, a graduate student at the University of Minnesota-Twin Cities, focused on restoring California black oak to support tribal values and wildlife habitat in the Sierra Nevada. Changes in natural fire processes, an increase in conifer trees, and browsing by species such as deer, have all caused California black oak to suffer. As part of their project, the students worked on collecting and organizing information on how Native Americans traditionally managed the trees. The assistantship opened Lackey’s eyes to the avenues in which Native American tribes and the Forest Service can work together in natural resource management, she said. Lackey, a citizen of the Cherokee Nation of Oklahoma, was born and brought up in the Sierra Nevada and, as a result, issues affecting the region were particularly pertinent. “I was looking at native species and tribes from my home state that I really wasn’t aware of when I was growing up there,” she said. 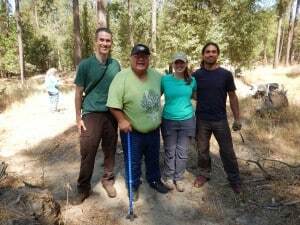 In particular, Lackey enjoyed working on a meadow restoration in the Sierra National Forest with Ron Goode, the tribal chairman of the North Folk Mono tribe. Meanwhile, Gutteriez, a member of the Wuksachi Band of Mono Indians, appreciated the opportunity to learn to apply Native American knowledge in the wildlife biology field, although he grapples with the need for western science to validate traditional ecological knowledge before it can be implemented in the field. “There’s a struggle with identity in how we are trained as academics and how we’re trained as scientists, and who we are and how we are raised,” he said. That was a source of personal internal conflict for me.” Gutteriez said that the assistantship reinforced his desire to work in the field more. Johnson, a student at the University of Minnesota-Morris and a member of the Red Cliff Band of Lake Superior Ojibwe, worked with research ecologist and project leader at USFS Northern Research Station Deahn Donner in Ottawa National Forest to gather data on bat populations within the forest using acoustic monitoring devices. Native Americans in their junior and senior years of college as well as graduate students can apply for this annual assistantship. Click here to download the application form. The application period has closed, but students may apply for the 2016-2017 program starting in August or September of 2016.